When you think of a healthy fast food chain, which one comes to mind? If you chose Subway, you’re not alone. According to a recent survey by market research firm Decision Analyst, Subway is the fast food franchise consumers trust the most for nutrition information. 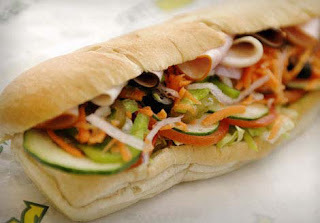 Subway is the leader in consumer trust with almost one-quarter (24.2%) of consumers saying they “completely trust” its nutritional claims…42% of Subway customers choose this restaurant because it “has a good selection of healthy items,” compared with only 3% of Taco Bell consumers who select this restaurant for its healthy menu. “Subway owns the nutritional claim relative to its competition, as there is a significant gap between Subway and these other popular fast food/quick-service restaurants.” Truth be told; Subway has taken great pains to portray itself as a healthy fast food, and if you look at the nutrition information on their menus and website, it is quite impressive, until you read the fine print. Subs with 6 grams of fat or less include 9-Grain Wheat bread, lettuce, tomatoes, onions, and green peppers. All other sandwich values include cheese unless otherwise noted.Salads contain meat/poultry, standard vegetables and do not include salad-dressing or croutons. Addition of other condiments and fixings will alter nutrition values. Any restaurant that presents their nutrition data this way will look better than those that don’t. But who in the world would dream of having a sub without a schmear of mayo or some other condiment? Or a salad without any dressing? Trust me, you actually NEED a bit of oil, not just to make the salad go down easier, but to increase absorption of some of the vitamins and minerals in the veggies. And even if by some strech of the imagination you actually swallowed down the sub without adding cheese or a spread, the sodium levels are atrocious! Four of the eight choices mentioned above provide over 1000 milligrams of sodium. That’s almost half a day’s worth for healthy adults. In conclusion: At best, Subway is the least un-healthy option out there. Don't let their marketing hype confuse you to into thinking that a Subway sandwich is a healthy meal choice.